Off early today (10/8) with around 400 Km to follow yesterdays similar distance drive. 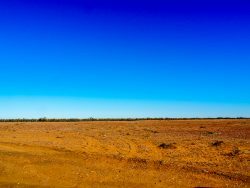 The Oodnadatta Track is in reasonable condition, but the dust is horrendous, I had to clean out the van to get rid of the dust, for the first time. 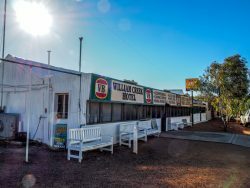 The first stop was at William Creek for a refuel, the only change since we were here in the 1980s is that the pub has a wooden floor rather than just dirt. 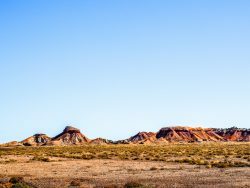 Then it was on to Oodnadatta through very flat and barren landscape, the only break was a line of trees that indicated acreek and then you were in it with lots of hardy trees looking very healthy despite the drought. Along the way you could see the remains of the old Ghan track that generally follows the road. Every now and then were the ruins of a fettler’s houses and a high water tank for the steam engines. 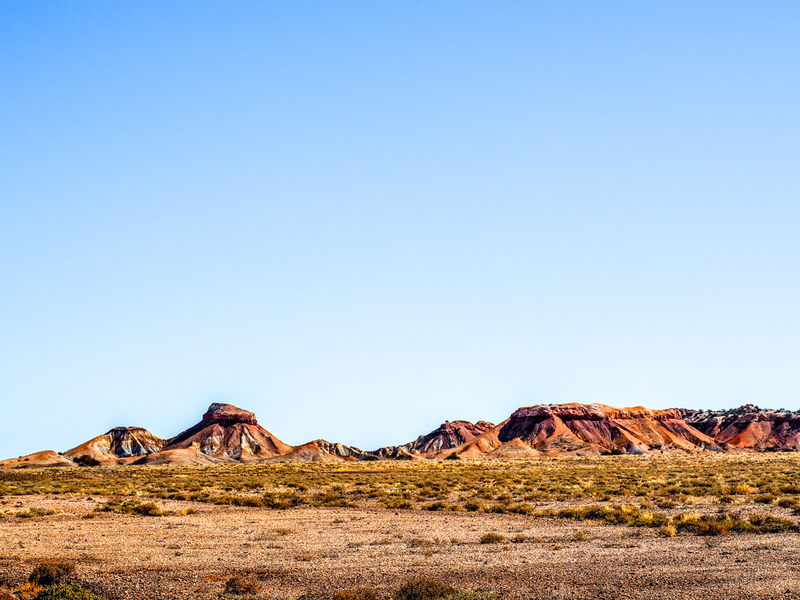 The photo gives you an idea of how desolate the country is, and not just in drought. 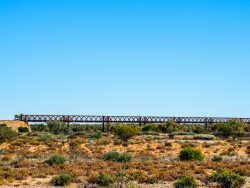 The next landmark is the Algebuckina Bridge on the old Ghan railway, the railway closed in 1980 with the last trip from Maree to Oodnadatta. 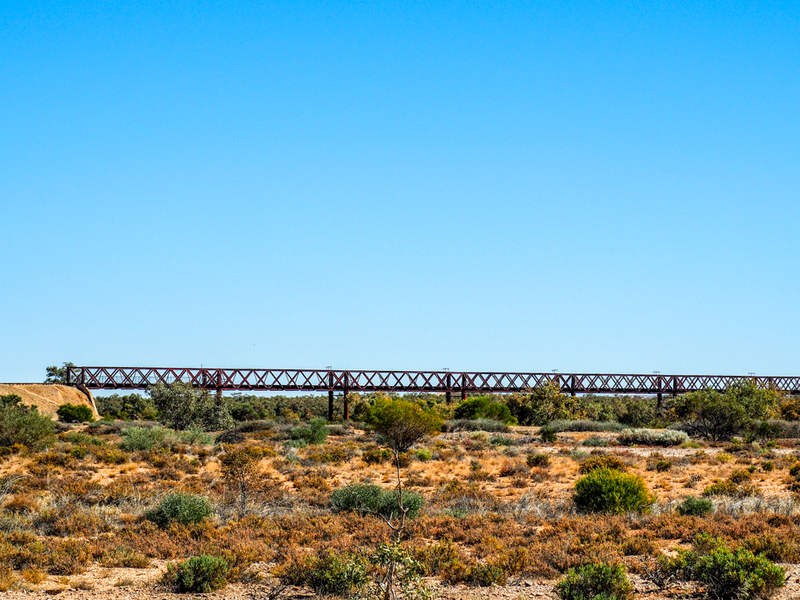 It is a massive bridge over what is usually a beautiful waterhole on the Neales River, but it is dry at the moment. The bridge took 352 men to build, and consists of 19 x 31 metre spans, it was opened in 1892. In 1926 it was strengthened to take heavier trains. 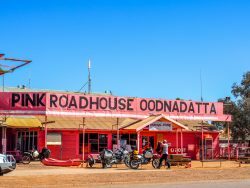 Then on to Oodnadatta, home of the famous Pink Roadhouse. The roadhouse was run by Adam Pate and his wife, but Adam tragically died some years ago in an off-road racing accident. 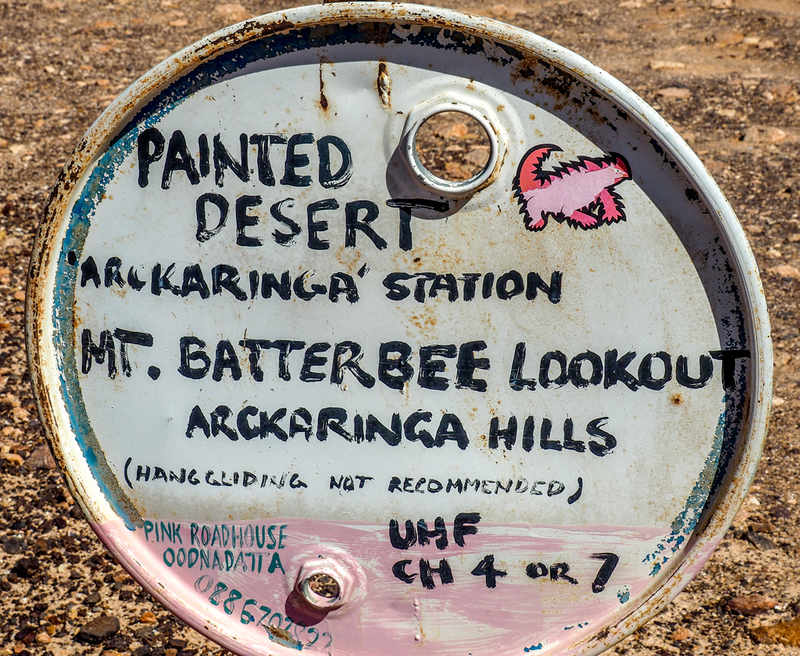 He was a real pioneer, in 1986 we met him at the roadhouse and he marked up our maps to show roads through the Simpson Desert. Our maps were the latest available but 20-30 years out of date. Another thing he did was to erect tens of signs through the area marking features or roads that were otherwise unmarked. 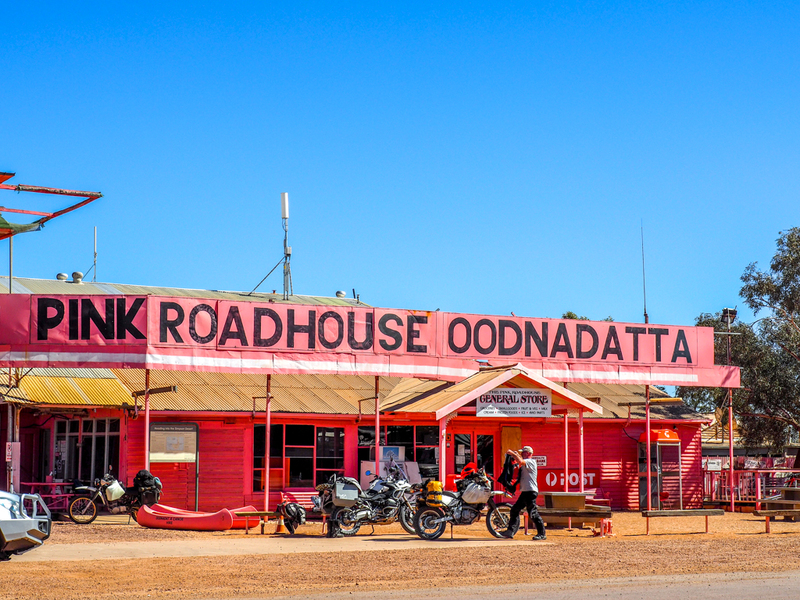 The photos below show the Pink Roadhouse, which looks the same as it did in 1986, and an example of one of his signs. 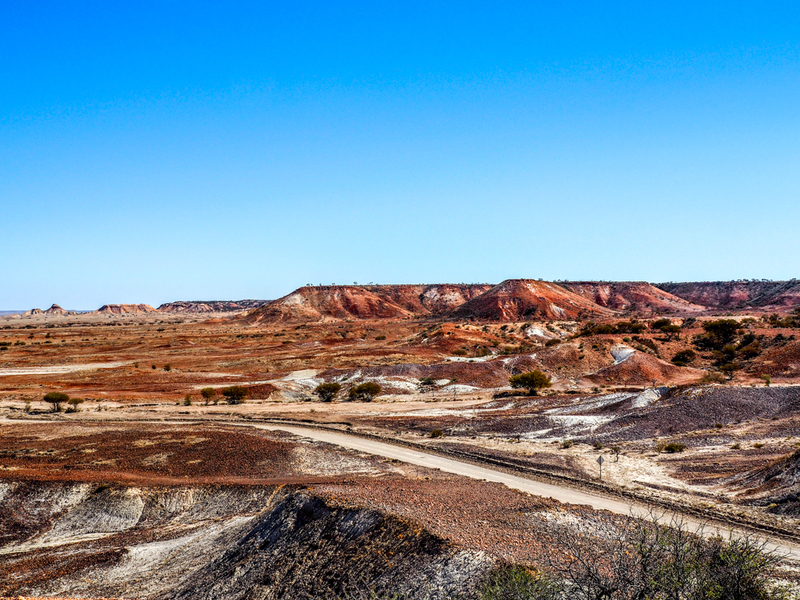 The painted desert is a series of hills, the Ackaringa Hills, consisting of rock of different colours. Mt Batterbee is a prime example. 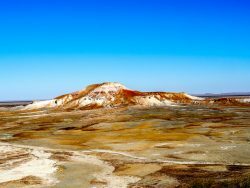 But the hills around Mt Batterbee are all coloured and some are of strange shapes. 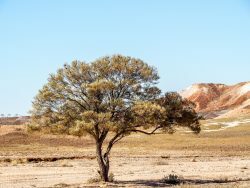 Along the roads all the way you see knarled old Mulga a characteristic tree of the outback, tough and very hard timber, they survive the worst conditions. There are 35 different types/species and they are acacias, strange as acacias are often short lived, but some Mulgas live for many many years. I love them and their timber, great for wood-turning. 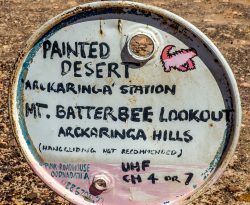 Tomorrow I am off the Kulgera on the Stuart Highway and then on to Uluru or Connor Springs Station about 100 Km from Uluru. The wind is still blowing and tonight it is at its strongest, a veritable howling gale. When you are towing it increases the fuel consumption by 5-6 litres/100 Km, and at $2.10 per litre it sure costs. I will be glad when it stops, but it does have benefits, on dusty roads it blows the dust away from vehicles you may be behind or approaching vehicles. So it’s not all bad. The trip to Kulgera was uneventful but through some good looking country, trees and more saltbush and grasses. It was good to get on the Stuart Highway and bitumen, it is so quite. 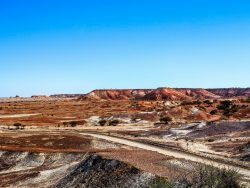 The country along the Stuart is much better tahn on the Oodnadatta Track, lots otrees and large bushes and plenty of dry grass. I’m at Kulgera now but sadly no 3G, but I will go over to the pub and try and use their WiFi. 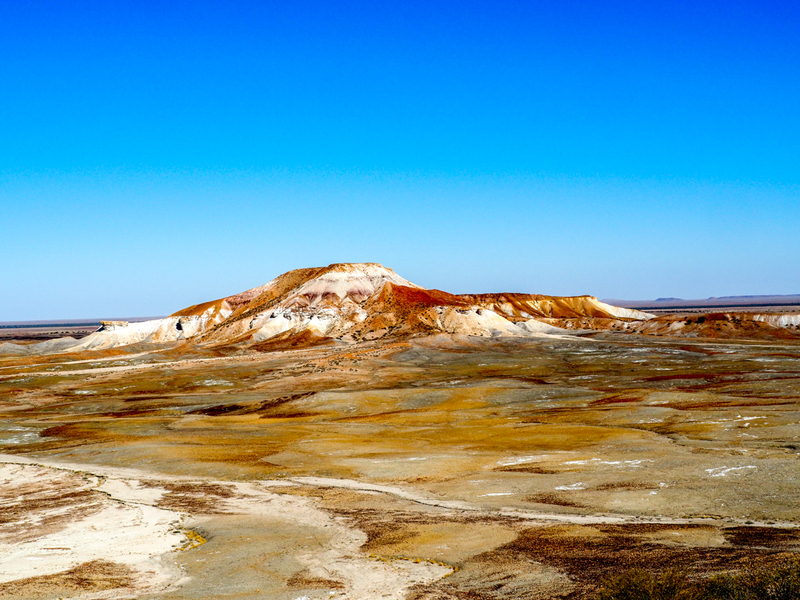 Beautiful dessert scenery. What temperature is it? 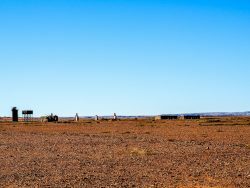 How many other travellers do you pass or meet on the Oodnadatta track? Are they all in 4x4s?